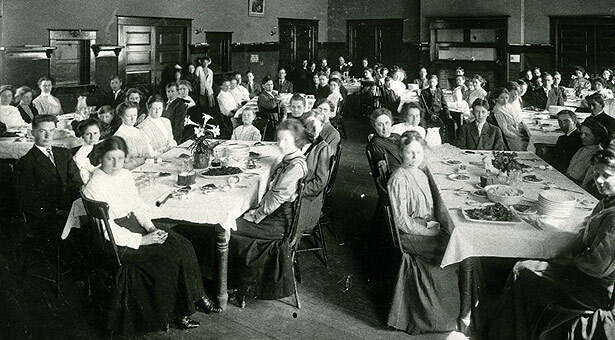 In this undated photo, Seattle Pacific students and (we think) faculty members are gathered at beautifully set tables in classy attire, ready to partake — as soon as the picture’s taken. Do you recognize the room? us below or at response@spu.edu with your answers, and tell us the setting for this meal. 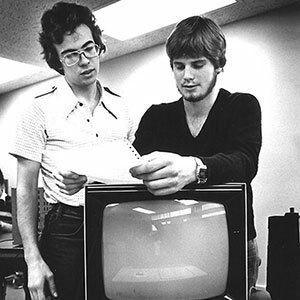 Pictured in the December 1980 issue of Response were two students: Martin Smith ’84 (right) and Jonathan Bisnett ’82, looking over a computer printout. In the accompanying article, Professor of Computer Science Mike Tindall was sanguine about the job outlook for computer programmers. “Today,” he said, “An employer can pay a secretary $15,000 for one year of work, or he can go down to his computer store and pay $12,000 for a nice computer system that will last years.” How times have changed. No Response reader correctly identified the photo subjects, so we didn’t have a contest winner. Better luck next time! Do you recognize this room? Be the first to identify the above photo's location, and you could win an SPU sweatshirt!